On Saturday November 3rd, people around the world will participate in Extra Life, a gaming marathon to raise funds worldwide for the Children's Miracle Network. Since its inception in 2008, Extra Life has raised more than $40 million for sick and injured kids. Our group of five friends will unite once again to raise funds and awareness for local children's charities by playing a combination of board games and video games for 24 hours straight. 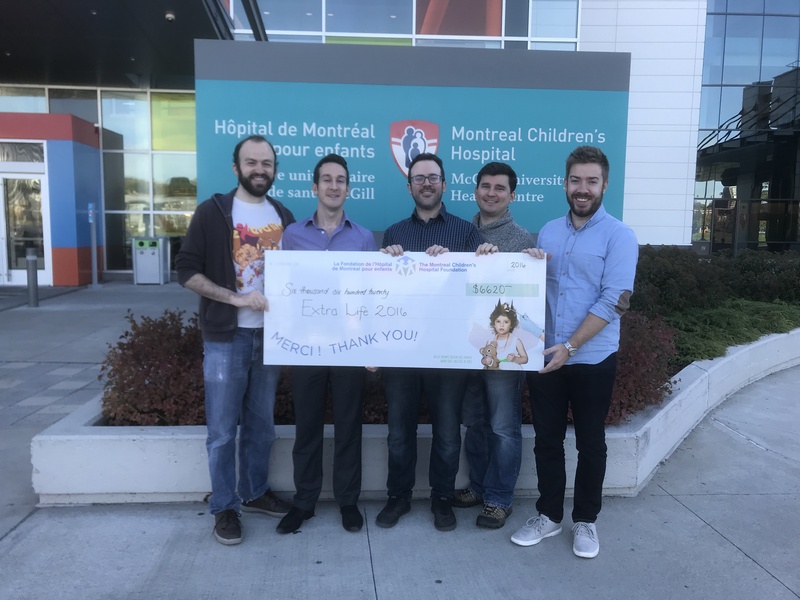 To-date, we have raised over $30,000 in the previous seven fundraisers and this year, we will once again be raising funds directly for the The Montreal Children's Hospital Foundation, a local organization that raises funds to support research, the acquisition of cutting-edge equipment, the development of innovative clinical programs, and the advancement of teaching. Below, you'll find footage of our event from 2015. We make a point of keeping an ongoing blog of our experience, so you can follow us along on our journey. Check out our past marathons in the archives section! If you would like to make a gift in any amount that you feel comfortable with, we would encourage you to do so. Your donation will go a long way towards diagnosing and treating pædiatric illnesses, and ideally helping more children go home from the hospital and enjoy their childhood the ways kids are supposed to.